Does Mold have a Hold? Any kind of water damage in a home has the potential for a growing problem. The good news is that homes for sale in the suburbs rarely have the ugly, drippy kind of mold infestation seen in the news reports and homeowners nightmares. The bad news is that any time water goes where it shouldn't in your house you will probably have mold unless it is completeky dried out within 48 hours. 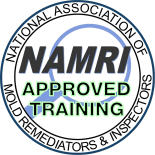 Getting rid of mold which can cause allergy-like symptoms in susceptible people -- require stopping the moisture or improving the bentilation as well as removing or encapsulating the mold. In addition to anywhere there's a leaky pipe or high humidity, such as a bathroom or kitch, prime areas for mold include attics and basements, especially where paneling has been appied over drywall and carpet is on concrete. While the really horrible health effects attributed to mold in Texasm Atlanta and Cleveland years ago have not been proved, some experts believe there is a link, said Larry Schwartz, an Arlington heights-based industrial hygienist. 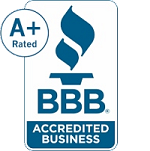 scwartz said any mold infestation in a house should be removed, no matter what type it is. For that reason, he thinks in most cases there is no sense in doing air tests to find out the mold variety. He does test after the remediation to be sure mold concentrations have been removed. Torre Loftis knew she had a problem when mold was discovered in both attics of the Lake Zurich home she wanted to buy. She and her husband, Paul, were recently married, and finding a home that the four teens in their blended family all loved had not been easy. 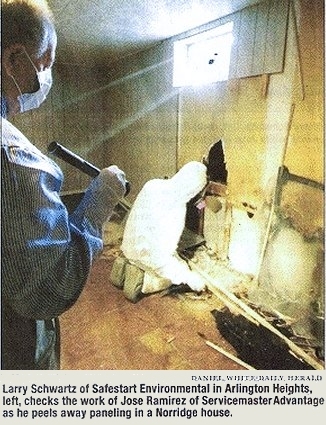 The home inspector the Loftises hired discovered the mold after which they had Schwartz investigate the situation. "Initially I was concerned," Torre Loftis said. "We have one kid with allergies and two with asthma. But after studying the issue I was confident they could eliminate the problem," she said. "The air came up normal afterwards, and I was reassured." The remdiation included a treatment similar to sandblasting in the attics and adding ventilation that apparently had been removed when storm damage was repaired, Loftis said. "You could see the mold 5 feet up on the beams in the attic," she said, "It wasn't in the insulation and it was reassuring that it hadn't gotten into the walls." Schwartz was impressed that Loftis got so involved in researching the issue and checking thr removal process. Mold grows on materials like drywall and wood. 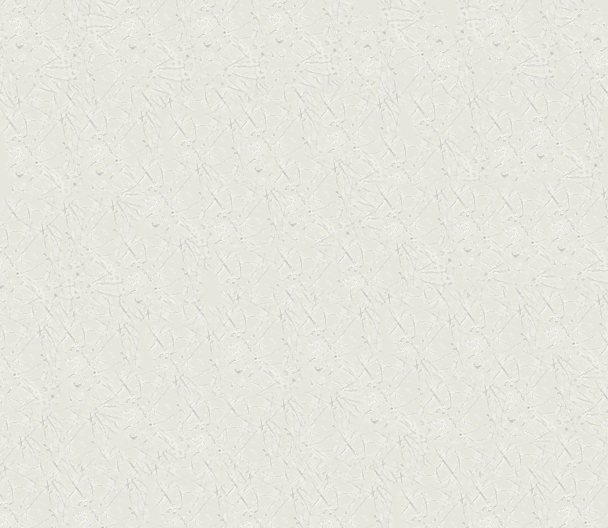 Generally, drywall, paneling, carpeting and ceiling tiles with mold infestation are thrown away. More expensive structural materials like support beams are cleaned and treated. NEW ORLEANS. A throng of visitors has invaded the French Quarter, but they aren't tourists. They're mold spores, and they're taking hold and growing furiously everywhere. On antiques in shuttered shops. On the white tablecloths of empty cafes and restaurants. On the walls and furnishings of boutique hotels. On the green-spiked Cole Haan high heels and alligator pumps in a Canal Street department store window. At the Hotel Provincial on Rue Chartres, which advertises "the grace and charm of old world elegance," gray mold has invaded about 50 rooms. It is growing on the claw legs of anti-que tables and on the gilt frames of mirrors and art prints. "It's starting in the rooms that weren't even damaged now," said Scott Boswell, owner of Stella restaurant across the courtyard from the hotel, as he led a tour. More than three weeks after Hurricane Katrina flooded much of this city, residents and business owners face another insidious calamity. 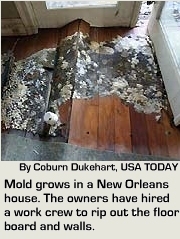 Hot, humid New Orleans has become a giant mold factory. "Mold is literally growing all over the city right now," said Carl Clayton, a New Orleans developer. Even homes spared from high water are at risk after three weeks with no air conditioning, Clayton said. And the longer residents are barred from returning, the more their homes will decay. "Some of these houses are going to have black mold growing up the walls and over the ceiling, and there's no way to stop it," he said. "It will eat up the drywall and destroy it. ... At some point, even the houses that could be saved will have to be torn down." learned already, they will find that getting rid of the furry stuff eating away at their wallboard and furnishings is labor-intensive, costly and sometimes a health threat. "It's going to be a huge problem," said Martin King, a technical adviser to the Association of Specialists in Cleaning and Restoration, a Maryland-based trade group for restoration contractors. "Mold spores are everywhere," said Claudette Reichel, a professor and housing specialist at Louisiana State University's AgCenter. "They are nature's recyclers. They break down materials like trees and plants and organic matter." rugs, drapes and bedding ? almost everything that got wet or even damp. Once a badly damaged house is stripped to the studs and other framing materials, the wood must be sanded and then disinfected with a bleach solution to kill remaining spores. Then the house must be thoroughly dried with fans or de-humidifiers. "It's basically rebuilding the house from the inside," Keith said. Some efforts will fall short. Anu Dixit, an assistant professor at the Saint Louis University School of Public Health, studied molds after Missouri River flooding. She found that mold returns in about one-third of affected houses, even after treatments. "People with allergies and asthma should not be involved in cleanup, and anyone whose immune system is compromised," Reichel warned. Some molds produce toxins that can cause serious health problems, including liver damage and cancer. In New Orleans' Carrollton neighborhood, mold has climbed to shoulder height in the house where brothers Karry and Felton Crowley grew up. 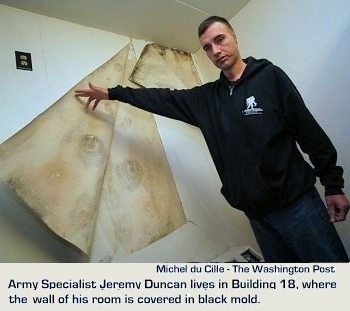 The mold has formed felt-like blooms on clothing, furniture and nearly everything else up to 5 feet off the floor. "Anytime you have sewage back up into your house and then sitting there for days, you got bacteria and mold growing all in there," said Karry Crowley, 48, who works in the engineering department for the New Orleans Public Library. Henry St. Amank, who owns Saint Construction in nearby Metairie, cleaned out a lawyer's office in the Mid-City area, where the water left a mark 2 feet up the inside walls. St. Amank started four days ago, but the mold had already traveled to 4 feet high. St. Amank and his crew ripped out the carpet, baseboards, doors and trim and marked the lower 4 feet of drywall for removal. They will soak the exposed framing with a mold-killing solution and allow it to dry before completing the repairs, which will take six weeks and cost about $25,000.